Dell coupon code numbers are the way to save big on purchase from Dell.com. With the right Dell coupons you can save on laptop computers, desktop PCs, netbooks, tablets, Alienware gaming rigs, monitors, printers, HDTVs, gaming consoles, software, mobile phones, and more. Browse below for online Dell coupons, discounts, and promotions for money off, free shipping, or specials deals. “There are 10 types of people in the world,” goes the geek saying, “those who understand binary, and those who don’t.” And those who get that joke also get computers, which is where Dell Home and Home Office comes in. Dell is, as you no doubt know, an international IT corporation that develops, sells, and supports computers and computer-related products. 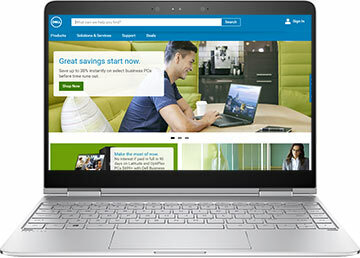 At the online Dell Computer Store (www.dell.com), you’ll gain access to their brand of laptops, notebooks, desktops, tablets, and all-in-ones, but you’ll also have the opportunity to shop a variety of electronics and software, printers, ink, HDTVs, home theater equipment, phones, and MP3 players. Technical specialists know precisely what they want in a computer, which makes this company’s many and varied options appealing. Whether your primary interest is gaming, performance, entertainment, or small business, this online store has the right computer for you. They offer Alienware, XPS, Inspiron, and Vostro computers as well as Precision Workstations, each tailored to meet your individual technological needs. When it comes to pocket tablets, there’s the Streak. If you’re more into building your own computer, this online store still has plenty to offer you in the electronics department. After all, this is one of the largest companies in the United States: in 2010, Fortune Magazine listed it as the 38th largest in the country and the 5th largest in Texas. At their website, frugal customers will discover daily deals, weekend deals, and sales on TVs, cameras, games, GPS devices, and storage devices. This online computer store sells Sony, Vizio, Sharp, Mitsubishi, Canon, Nikon, Flip, Kodak, Logitech, Magellan, Garmin, TomTom, and other popular technology brands. They boast their own line of printers, including laser, monochrome, color, LED-laser class, multifunction, photo, wireless, and all-in-one printers. Save big on ink and toner with printer ink value bundles. If you want to keep on top of the latest tech blogs and magazines while switching between them and your favorite science-fiction novel, you can purchase an E-Reader, PDA, or handheld from Sony, Aluratek, Socket Mobile, Pharos, or Case Logic. They even offer their own version of the smart phone, an Android powered by Venue, which allows you to access your photos, music, and other content with a simple touch. There’s also the Venue Pro Windows smartphone. And, finally, don’t forget to stop by the Dell Outlet to satisfy your tech fix at a low cost.